What Are The Best Online Master's in Curriculum & Instruction Programs? What Else Can I Expect from an Online Master's in Curriculum & Instruction Program? Earning your online master's degree in curriculum and instruction gives you advanced training in creating engaging lessons for students at all educational levels. Professionals who earn this degree pursue careers as teachers, instructional coordinators, and administrators. The U.S. Department of Labor Statistics projects that jobs in the field of education will grow by 9% between 2016 and 2026. Demand will continue to grow as more students attend college and children enroll in public schools. WHAT CAN YOU DO WITH A CURRICULUM AND INSTRUCTION MASTER'S? Professionals with a master's in curriculum and instruction are prepared for many positions, including instructional coordinator, high school principal, and high school teacher. Read more here..
WHAT IS A MASTER'S IN CURRICULUM AND INSTRUCTION? A master's in curriculum and instruction prepares students to create engaging lessons at all academic levels. Graduates are current on the latest trends, research, theories, and methods in education, which they use in their career. Read more here..
WHY GET A MASTER'S IN CURRICULUM AND INSTRUCTION? The Bureau of Labor Statistics projects the field of education to grow over the next decade, and a master's degree in curriculum and instruction prepares many teachers to advance their careers and obtain higher salaries. Read more here..
HOW LONG DOES IT TAKE TO GET A MASTER'S IN CURRICULUM? Most master's in curriculum and instruction programs require about one year of full-time study to complete. Some schools offer accelerated options, which allow students to complete the program quicker. Programs that follow a cohort format sometimes take more time to complete. Read more here..
IS A MASTER'S IN CURRICULUM AND INSTRUCTION WORTH IT? Yes. The field of education is projected to grow, according to the Bureau of Labor Statistics, and earning this degree helps many teachers obtain higher salaries. Read more here..
UF offers a master of education in curriculum and instruction with an emphasis in educational technology that prepares students for careers as educational technologists and instructional designers. The program explores how the internet, media, and other technological developments affect the contemporary learning environment and teaches students how to integrate new technologies into their classrooms and curricula. UF offers five online sessions per year, including one fall, two spring, and two summer sessions. The 36-credit degree includes both a nine-credit curriculum and instruction core and a 12-credit educational technology core. These core classes provide students with foundational knowledge of instructional design, integrated media environments, and current issues in educational technology. Students must also enroll in 12 credits of educational technology electives, allowing them to customize their studies through a variety of courses, including the internet in K-12 instruction, media ecologies and open education, and games and situations for teaching and learning. The program concludes with a three-credit practicum course that asks students to reflect on their overall learning experience through the exploration of a technology and learning question. The practicum includes a significant writing component and an in-depth peer review process. Students may only take the practicum course during the spring semester, and the course occupies both eight-week spring sessions for a total of 16 weeks. This online master's in curriculum and instruction program can be completed in about two years if students enroll in two courses each semester. Applicants must have a minimum GPA of 3.0 in all upper-division undergraduate coursework to be considered. The school accepts transfer credits, although they prefer courses that have been completed recently and that are relevant to the program a student is enrolled in. UF is accredited by the Southern Association of Colleges and Schools Commission on Colleges. UV offers a master of education in curriculum and instruction that teaches students how to develop an effective curriculum and emphasizes the history, philosophy, and theory of curriculum development. Students can customize their online curriculum and instruction degree with one of four concentrations: reading education, gifted education, English language learners, or instructional technology. The program is offered through the Curry School of Education and offers small sizes, allowing students to receive one-on-one attention from instructors. The 30-credit program is split evenly between required core and elective concentration courses. Core courses cover a variety of foundational topics, including curriculum design, differentiation, classroom assessment, and education across cultures. Students can transfer up to six credits toward their degree if those courses are deemed relevant to the program by an academic adviser. This online master's in curriculum and instruction can be completed in one year of full-time study, or up to five years of part-time study. The program offers three start dates per year, making it ideal for working teachers. Graduates are prepared to pursue curriculum development roles in PreK–12 public or private schools, alternative schools, adult education programs, charter schools, community colleges, state education departments, and more. All online students at UV pay the same tuition rate, regardless of residency. However, K-12 educators in Virginia can take advantage of a discounted tuition rate. Applicants must provide GRE scores, evidence of National Board teaching certification, or pass two of the program's courses as a non-degree student with a "B+" grade or better, and submit a writing sample to be considered. This program is accredited by the Council for the Accreditation of Education Preparation. NC State offers a master's in curriculum and instruction online that focuses on New Literacies & Global Learning and prepares students to develop curricula in a globalized, technology-rich classroom. Students can customize their degree by choosing a concentration in English language arts (middle and high school), K-12 reading, or social studies (middle and high school). This program explores the intersection of digital literacies, such as text messaging and social media, with modern instruction techniques. The program is offered in a hybrid format, with half of the classes offered online and half on campus. Full-time students typically enroll in three courses (nine credits) per semester, while part-time students enroll in 3-6 credits. NCSU’s curriculum and instruction master's program is offered in two degree formats: a 30-credit master of education or a 36-credit master of science. The core curriculum for both degrees is the same, but students pursuing the master of science track must complete an additional six credits of thesis work, including three credits of thesis research and three credits in research methodology. Students in both programs take 12 credits of core courses along with 18 hours of concentration classes. Students will also generate global connections through a combination of international study travel and virtual global education experiences. The master of curriculum and instruction emphasizes project-based inquiry and students begin by posing a teaching-related question that they explore throughout the course of their program. The program concludes with a Design Studio Showcase, in which students present the results of their inquiries to their cohort and faculty members. NC State is accredited by the Southern Association of Colleges and Schools Commission on Colleges. Texas A&M's Department of Teaching, Learning, and Culture ranks as one of the top education colleges in the country. The school offers a variety of degrees that emphasize collaboration, diversity, creativity, democratic governance, critical thinking, and global leadership. The online master of education in curriculum and instruction teaches students about four key topics: academic learning, family and community partnerships, school improvement, and social climate and emotional well-being. This program is perfect for students who plan to pursue a career in education evaluation, development, and coordination. The 36-credit program uses a varied online format that incorporates eCampus, Moodle, video lectures, chat rooms, and other virtual course materials. The curriculum includes 12 credits of core courses and 24 credits of electives. Core courses cover a variety of topics, including cultural foundations of education, curriculum development, and analysis of teaching behavior. Elective courses allow students to customize their degree, and up to two electives can be taken outside of the education department with permission from a faculty adviser. The master of curriculum and instruction does not require a thesis, although students must complete a three-credit reflective inquiry course during the final semester, where they trace the development of their education practice throughout the program. The program offers start dates in both the fall and spring semesters and is designed to work around the schedules of working teachers. Applicants must apply to both the Department of Teaching, Learning and Culture and to Texas A&M University itself. They must submit an online application to be considered and GRE scores are not required. The degree does not include a path to teacher certification, although Texas A&M does offer online certification options. Texas A&M is accredited by the Southern Association of Colleges and Schools Commission on Colleges. USF is a public research university that was founded in 1956 in Tampa, Florida. The school is one of the largest public colleges in the state and offers a variety of distance learning programs, including an online master of education in instructional technology. This program trains students to design online courses and other digital learning environments. Graduates are prepared to pursue careers in K-12 schools, higher education, the education industry as instructional technologists, curriculum developers, eLearning specialists, technology coaches, and multimedia instructional designers. The degree is offered entirely online and through a combination of distance learning and on-campus classes. This 33-credit curriculum and instruction master's degree consists of 11 courses, including three educational foundations courses, six concentration courses, and two additional elective courses. Concentration courses cover topics such as interactive media, distance learning, and current trends in educational technology, and electives options include game design and development for learning, problems in instructional design for computers, digital video, or technology leadership in education. Students can also complete a three-credit internship in eLearning development, allowing them to gain valuable hands-on experience in the industry. All required courses are typically available at least twice per year, while some electives may only be available once each year. Students earning their curriculum and instruction master's degree can simultaneously earn credit for one of USF's many online certifications on subjects like cybersecurity education, digital/virtual educator, distance education, and eLearning design. Many courses count to more than one graduate certificate, allowing students to potentially complete multiple certificates while earning their master's degree. Students can also transfer up to 12 credits from another institution, as long as they were earned with a minimum GPA of 3.0. Applicants must have a minimum undergraduate GPA of 3.0, minimum graduate GPA of 3.5, and provide GRE scores to be considered. USF is accredited by the Southern Association of Colleges and Schools Commission on Colleges. Tallahassee, Florida-based FSU is one of the oldest and largest colleges in the state, with over 300 degree programs, including an online master's in curriculum and instruction. The program is designed for both new and experienced teachers alike and teaches students how to meet the needs of diverse groups of students, address changes in the state and local education standards, and use research-based teaching approaches to sold modern education issues. Students can choose from one of seven specializations: elementary education, English education, foreign and second language, mathematics education, social studies education, science education, and special education. This 33-credit program encourages students to use their own teaching practice to explore ideas, technology, and techniques from the program curriculum and gauge their effectiveness on a local level. Students enroll in 21 credits of core coursework, covering topics such as data-informed instruction, culturally responsive teaching, and the relationship between teaching and technology. They also enroll in 12 additional credits of concentration courses, building deeper knowledge in their chose specialization. At the end of the program, students curate a portfolio of their most significant work, which they must present and defend to a body of faculty members. The program does not require a thesis or culminating capstone course. The program can be completed in two years of part-time study. Most classes delivered asynchronously online, although certain courses include real-time interaction with professors or other students. The program can be completed in just two years of part-time study. Applicants must have either an undergraduate degree with a minimum GPA of 3.0 or a graduate degree to be considered. FSU is accredited by the Southern Association of Colleges and Schools Commission on Colleges. CIU is a multi-denominational Christian college based in Columbia, South Carolina. The school offers a variety of distance learning programs, including an online master of education. This program prepares students to pursue curriculum and instruction jobs in Christian education settings. Students can choose one of two tracks: educational administration or instruction and learning. Educational administration is perfect for students interested in leadership positions in Christian or missionary schools, while instruction and learning is ideal for those interested in becoming better educators. The 36-credit curriculum includes nine credits of foundational courses, 12 credits in core classes, and 12 credits of electives. Foundational courses explore the intersection of Christianity and education, with topics such as biblical foundations for curriculum and the history and philosophy of education. Core courses cover a variety of topics, including understanding the learner, curriculum development, educational assessment, and educational research. The administrative track covers subjects such as leadership theory, school law, and staff supervision. The instruction and learning track includes coursework on supervision of instruction, differentiated instruction, and designing instruction for understanding. While the majority of courses are offered in an asynchronous format, some require online chats and live discussions. The curriculum is aligned with certification requirements for the Association of Christian Schools International (ACSI). Graduates are prepared to obtain Professional ACSI certification, which remains valid for five years. Applicants must provide GRE verbal and quantitative scores above the 50th percentile and a minimum analytic score of 3.5 to be considered. They must also have prior educational experience as an administrator or instructor. CIU is accredited by the Southern Association of Colleges and Schools Commission on Colleges. MSU is a public research university that was founded in 1855 in East Lansing, Michigan, as a land grant college. Today, the school serves more than 50,000 students annually and is the largest college in the state. MSU offers a variety of distance learning programs, including an online master's of arts in teaching and curriculum. The program is open to a wide range of professionals, including both new and experienced teachers, and includes different curriculum options for those with different levels of experience. The curriculum is centered around three primary objectives: helping students engage in critical inquiry, develop as accomplished teachers, and become effective teacher leaders. Students can choose one of seven unique concentrations: educational technology, educational psychology, K-12 educational administration, literacy and language instruction, socio-cultural perspectives in teaching and learning, science and mathematics education, and English as a second language. This program consists of 30 credits, including nine credits of professional development and inquiry core courses, nine credits in concentration courses, and 12 credits of electives. Core courses focus on classroom teaching, professional roles, and teaching practice, while electives and concentration courses allow students to customize their degree by selecting from dozens of different courses. All students must also complete a capstone one one of the following two topics: curriculum design, development, and deliberation in schools or teachers as teacher educators. Students must also submit both a synthesis paper and a professional portfolio. Both of these requirements are reviewed by faculty members and take the place of a comprehensive final examination. Students typically complete the program in two years, though they have up to five years to earn their degree. MSU undergraduate education majors who have completed the school's teacher certification internship can transfer up to nine credits toward their master's degree, allowing them to complete the program in just one year. MSU is accredited by the Higher Learning Commission. FIU was founded in 1965 in Miami, Florida, and is one of the best graduate research institutions in the state. Today, the school serves more than 3,400 students each year and offers a variety of distance learning programs, including an online master's of science in curriculum and instruction. This program teaches students how to serve diverse student populations, and the program emphasizes curriculum and instruction approaches that accommodate linguistically and culturally diverse learners. This 36-credit program is offered in an accelerated format where students can enroll in six eight-week terms that allow them to earn their degree in just one year. Students enroll in four courses each semester, completing two courses every eight weeks. The program offers unique courses such as developing a global perspective, education of the child in urban society, and politics of curriculum, along with core courses like foundations of education research and curriculum design for childhood education. The degree concludes in an action research project, which allows students to identify and solve education issues in a classroom setting. Since the project requires hands-on experience, students will need access to a K-12 academic environment to complete their research. All online students at FIU pay the same tuition rate, regardless of residency. Applicants to the master's of curriculum and instruction program must possess either valid teaching certification or a valid letter of eligibility and a passing score on the General Knowledge and Subject Area portions of the Teacher Certification Examination to be considered. FIU is accredited by the Southern Association of Colleges and Schools Commission on Colleges. Virginia Tech was founded in 1872 in Blacksburg, Virginia as a land grant university. Today, the school serves more than 30,000 students annually throughout its seven campuses and online degree programs. The school offers a master of arts in education, curriculum, and instruction with a focus on instructional technology that prepares students to work as professional instructional technologists and create improved learning experiences in K-12 schools, community colleges, university settings, and other educational environments. The 30-credit online master's in curriculum and instruction includes 18 credits of foundational courses, nine credits of concentration courses, and a three-credit research class. Foundational courses focus on theoretical topics in instructional technology, providing students with a strong background in learning design. Concentration courses allow students to choose from a range of instructional technology topics, including software evaluation, distance education, visual literacy, and applications of digital media. Instead of a thesis, students must complete a three-credit project and report. In this project, students will complete a substantial independent self-study in an area of their choice and present a comprehensive written report on their findings. The program concludes with a three-credit portfolio course, where students curate their strongest work samples and reflect on their overall experience in the program. Most students earning their master's degree in curriculum and instruction are employed full-time, and typically complete three credits each semester and six in the summer. Following this standard study plans allows students to earn their degree in about three years. All courses are offered each semester, so students don't have to worry about scheduling restrictions. Students can transfer as many as six credits from another accredited institution as long as they are related to instructional technology and have been completed within the past five years. Virginia Tech is accredited by the Southern Association of Colleges and Schools Commission on Colleges. Located in Salt Lake City, Utah, WGU designed its online master's degree in curriculum and instruction for educators and for professionals in corporations and nonprofit organizations. Students in the master of science in curriculum and instruction do not need an academic background in education. However, students must have access to a group of 15 or more learners with whom they can engage during the capstone project. The 13-course, interdisciplinary curriculum explores topics in curriculum and instruction, current and emerging technology, and research. Students take one course at a time and progress to the next course after demonstrating mastery of material. This unique approach develops strong competencies in areas such as educational psychology, curriculum design, and assessment for student learning. Most students take two courses per six-month term and complete the program in 10 to 26 months. Mentors assist students with course selection. Although students complete coursework primarily online, WGU requires on-campus residencies. WGU offers start dates on the first of each month. Applicants must hold a bachelor's degree from an accredited institution, must submit official transcripts, and must undergo an intake interview. In-state and out-of-state students pay the same per-term tuition rate. The program considers transfer applicants on an individual basis. Mississippi College is a Christian university based in Clinton. The college offers a fully online master of education in curriculum and instruction. Unlike other online curriculum and instruction degrees, MC's program integrates research-based coursework with spiritual guidance. Full-time students complete the 30-hour program in as few as 10 months. The program is structured in seven-week terms, which allows students to progress quickly through the curriculum. Students complete nine core credit hours before beginning 21 hours of methodology coursework that explores topics such as instructional dimension of leadership, information management dimension of leadership, project-based science curriculum, and technology in education. MC students must maintain a minimum 3.0 cumulative GPA. The program culminates in a comprehensive examination from which students with a cumulative 3.75 GPA are exempt. Although the program does not require a capstone, several courses involve small projects that facilitate hands-on learning. Graduates are eligible to upgrade their Mississippi class A teaching license to a class AA license. MC offers four start dates throughout the year. In addition to a bachelor's degree, applicants must hold a five-year, renewable teaching license in elementary, secondary, or K–12 instruction. Applicants must submit official transcripts, a copy of their teaching license, and documentation of examination scores. All online students pay the same tuition rate, regardless of residency. USD's experienced faculty members provide hands-on training for students earning their master's in curriculum and instruction online. Graduates are versed in the theory and practice of curriculum design for a variety of educational environments. USD's master of education with a specialization in curriculum and instruction program comprises 30 credits and an orientation course. The curriculum includes course options in teaching digital readers, teaching digital writers, identifying and responding to the needs of diverse learners, leading professional learning communities, cognition and learning, and creativity and innovation in STEAM. Five courses, including a capstone project, comprise the required core. Students take two courses per semester for five semesters. Each course lasts seven weeks, and students take only one course at a time. Because the program features hands-on learning components, students must have access to a classroom and a group of students for the duration of the program. Applicants must have earned a bachelor's degree from a regionally accredited institution with a minimum 2.75 cumulative GPA. Applicants must have at least two years of full-time teaching experience, but teaching licensure is not required. Applicants must submit official transcripts, two 500-word essays, and two letters of recommendation. USD does not require GRE scores. The application process includes a phone interview. California residents and out-of-state students pay the same tuition rate. UWF is a regional comprehensive university that was founded in 1963 in Pensacola, Florida. Today the school serves more than 13,000 students each year and offers a variety of distance learning programs, including an online master's of education in curriculum and instruction. The program is designed for both professional educators and aspiring teachers, allowing students to specialize in elementary, middle, or secondary education. Graduates are prepared to pursue instructional and leadership roles at all levels of K-12 education. Students must also choose one of six cognates: reading endorsement, elementary, middle level, secondary, professional training option, or instructional technology. This fully accredited master's in education curriculum and instruction features a 21-credit core curriculum, with 12 credits dedicated to the Department of Teacher Education and Educational Leadership core and nine credits to an educational investigative sequence. All remaining credits are allocated to the concentration cognate, which focuses on subject-specific instruction at the appropriate grade level. This program is accredited by the National Council for Accreditation of Teacher Education, but it is not intended to lead to initial teacher certification. Unlicensed teachers should consult with an academic adviser to determine their best path toward initial certification. Current teachers are also advised to meet with their school districts to determine whether this degree qualifies them for a salary increase. Applicants must have a bachelor's degree with a minimum GPA of 3.0 or submit official GRE or MAT scores to be considered. UWF offers enrollment to students in every U.S. state except for Massachusetts. Created in 1996, CU Denver’s online program is one of the oldest in the country. The school offers a variety of distance learning programs, including an online master's of arts in curriculum and instruction: reading and writing. The program focuses on helping educators improve literacy and offers two distinct academic tracks: one which focuses on reading and writing and adds an endorsement from the Colorado Department of Education, and another that combines the reading and writing focus with an individually-designed specialization. Students can also earn CU Denver's early literacy certificate online, which can be applied towards their master's degree. Several Colorado school districts also offer hybrid certificate programs through a Literacy, Language, and Culturally Responsive Teaching Program. This 30-credit program can be completed in just one year of full-time study. Students must enroll in nine credits of core concentration courses, 15 credits of course inventories, a three-credit research course, and a three-credit culminating capstone course. All coursework is delivered entirely online through Canvas and emphasizes topics such as language and literacy, reading development and assessment, research in schools, and culturally-sensitive teaching methods. Graduates can move on to higher roles within their current school or pursue new positions as interventionists, Title I teachers, and literacy or instructional coaches. Students can apply for one of six academic scholarships available each year, allowing them to reduce the costs of their education. Licensed teachers employed at qualifying schools can also apply for federal TEACH grants. CU Denver is accredited by the Higher Learning Commission. CSUF offers a master of science in education with a concentration in elementary curriculum and instruction designed for working teachers. The degree prepares students to pursue leadership roles developing curricula for early childhood education, math and science teaching positions and roles in school staff development. The program features a prescribed study plan, but students may work with an adviser to substitute a specialization in one of six areas of emphasis. The 30-unit curriculum includes nine units of core courses, six units of coursework in instruction, six units of coursework in curriculum development, six elective units, and a one- to three-unit culminating experience. Courses include earning theory for classroom use, curriculum theory and development, culture and education of Latino students, assessment across the curriculum, and integrated language arts and social studies. To fulfil the culminating experience requirement, students choose to complete a research project or a thesis. Applicants must have an undergraduate degree from a regionally accredited institution and a minimum 2.5 GPA in their last 60 semester hours of 90 quarter hours. Applicants must either hold a basic teaching credential or demonstrate sufficient relevant experience. Because CSUF's online master's degree in curriculum and instruction is a classified admission program, the university may ask applicants to submit GRE scores. All online students pay the same tuition rate, regardless of state residency. George Mason offers a master of education in curriculum and instruction with a focus in assistive technology that teaches students how to serve disabled populations through the use of adaptive and rehabilitative devices. The program trains teachers how to assess, implement, and research the applications of assistive technology in an educational setting, and trains them to work with disability populations, their family members, and disability service providers. This program is relevant to a range of educators and other professionals, from general and special educators to occupational therapists, adult service providers, and caregivers. The 30-credit curriculum includes 24 credits of required courses, covering subjects such as augmentative communications, designing adapted environments, assistive technology assessment, and web accessibility and design. Students must also enroll in one research course, either educational research in technology or special education research. Finally, they must enroll in two additional elective courses, with options including universal design for learning, software and mobile applications for individuals with disabilities, and assistive technology for independent living or the workplace. Courses are offered entirely online using Mason's virtual lab software. Distance learners who are Virginia residents and Pre-K-12 educators can receive a special tuition discount. Applicants must have a bachelor’s degree with a minimum GPA of 3.0 in their final 60 credits of study to be considered. Graduates commonly go on to pursue careers as assistive technology coordinators, trainers, and team leaders. All courses requirements for the MEd also count toward George Mason’s PhD in education, which can be completed at an accelerated rate through additional on-campus study. Many of the program courses also count toward recertification credit for K-12 teachers. George Mason is accredited by the Southern Association of Colleges and Schools Commission on Colleges. UH was founded in 1927 in Houston, Texas, and is now one of the largest schools in the state. The school offers a variety of distance learning programs, including an online master's of education in curriculum and instruction. This program prepares students for careers not only in teaching and academia, but also in military, business, health science, and community settings. Students can pursue one of four distinct concentrations: mathematics, design and technology, early education, or health science education. Many students also earn certificates in disciplines like educational graphics or online teaching and learning. The mathematics and early education degrees are standard curriculum programs that train teachers for work in academic settings, while the health science and design/technology concentrations prepare graduates for more diverse teaching positions. The health science degree is relevant for medical, nursing, and dental professionals who want to teach in academic health settings, but it can also be useful for residents, researchers, program coordinators, and other professionals interested in academic medicine. The design and technology programs prepare teachers to use technology in academic settings and the private sector. Graduates are prepared to pursue a variety of positions, such as instructional designer, technology specialist, and learning technologies manager. All four degree tracks consist of 30 credits and can be completed in five semesters of part-time enrollment. Students must complete two professional seminars, focusing on education research and educational leadership, which are typically completed during the first two semesters of the program. They must also complete a capstone course during their final semester in the program. UH is accredited by the Southern Association of Colleges and Schools Commission on Colleges. Liberty is located in Lynchburg, Virginia, and is both the largest private nonprofit college and largest Christian university in the world. The school offers nearly 300 distance learning programs and serves 100,000 online students each year. The school offers two options for curriculum and instruction master's programs: a master's of education in teaching and learning and a master's of education in program specialist. Both programs prepare graduates to pursue curriculum and instruction positions in public and private Christian schools. Students can choose one of a dozen concentrations, with options including elementary education, education technology and instruction, history, and special education. Those pursuing the program specialist concentration must choose between a further specialization as either math specialist or reading specialist. The program consists of 36 credits, including 15 of advanced education courses such as learning theory, foundations of education, and educational research and assessment. Depending on a student's concentration, they take an additional 12-15 credits of specialization courses and six to nine credits of professional courses. The program specialist track leads to Virginia advanced licensure, and applicants to the program must already hold initial teacher licensure. Students in the specialist track must also complete a three-credit internship, which may be performed either in Lynchburg or in a student's own community. The teaching and learning track does not lead to state licensure, except for add-on licensure options through the early childhood and gifted education concentrations. Some teaching and learning specializations offer optional three-credit practicum experiences that allow students to learn through hands-on experience. While the majority of courses are offered online, most concentrations require a limited on-campus attendance. Some may also include session that take place over a few days on Liberty's Lynchburg campus. Liberty is accredited by the Southern Association of Colleges and Schools Commission on Colleges. UNK is located in Kearney, Nebraska, and is one of the topic public colleges in the Midwest. The school offers a variety of distance learning programs, including an online master's of arts in education: curriculum supervisor of academic area. This degree is intended for licensed teachers who hold a valid endorsement in an academic area and who have two years of teaching experience. The program prepares graduates to pursue careers as academic field supervisors with emphasis in a specific academic subject. The curriculum fulfills requirements for the Standard Administrative and Supervisory Certificate with endorsements in a subject field. A non-certification option is also available. This 36-credit program includes six credits in foundational courses, introducing students to the social foundations of education and practice of educational research. Students take 30 credits of additional required courses that cover both educational theory and management strategies, from advanced educational psychology and curriculum planning to human resources management and administrative theory. Students must also complete an internship in an administrative educational setting, with most students performing internship hours at their current place of employment. The master's of curriculum and instruction can be completed in two to three years of part-time study. Students can begin the program in either the fall, spring, or summer semesters. Out-of-state students should check with their state’s department of education to determine if UNK’s program meets certification requirements. Students with previous graduate-level experience can transfer as many as six credits of coursework toward their degree. UNK is accredited by the Higher Learning Commission. Based in Edinburg, UTRGV offers a fully online master of education in curriculum and instruction with an emphasis in digital literacy. One of the most practical online curriculum and instruction programs, coursework provides skills necessary to develop curricula as professional educators. The curriculum incorporates the needs of South Texas' education system while examining the national agenda for reforming curriculum development. Most students complete the 30 required credit hours in three years. Students complete 15 hours of core courses and six to 12 hours of specialization courses. Students can complete an optional six-credit thesis, and the program concludes with a comprehensive examination. Students work with an academic advisor to select specialization and elective courses. Advisors evaluate requests to take courses in other education departments or in outside disciplines. Required classes include curriculum problems and processes, foundations of research in education, and introduction to historical and sociocultural foundations of education. UTRGV offers four start dates per year. Applicants must have a bachelor's degree from a regionally accredited institution and a minimum 3.0 GPA in their last 60 credit hours. Applicants who do not meet GPA requirements must submit GRE scores of at least 150 verbal, 141 quantitative, and 4.0 analytical. Applicants must submit official transcripts and a professional resume. All online students pay the same tuition rate. ASU's online master's degree in curriculum and instruction combines theory and practice through rigorous courses and hands-on applications. The 30-hour online master of education in curriculum and instruction and applied behavior analysis is a multidisciplinary program that explores areas of cognitive science, psychology, and sociology. Courses examine behavior change systems, methods of applied behavior analysis for exceptional populations, behavior assessment, and research methods. All courses follow a prescribed sequence, with no elective options. Students take one course at a time and complete the program in approximately five semesters. Although ASU delivers online courses asynchronously, students must meet assignment deadlines and participate in weekly discussion forums with peers and professors. The program culminates in a capstone project. Graduates often pursue careers as curriculum developers, behavior analysts, school psychologists, marriage counselors, and social workers. Graduates are also equipped to provide services as consultants in a variety of professional settings. ASU offers start dates every seven and a half weeks. Applicants must have a minimum 3.0 GPA in the last 60 credit hours of undergraduate study or a cumulative 3.0 GPA in a regionally accredited master's degree program. Applicants must submit a personal statement, a resume, three letters of recommendation, and documentation of English proficiency. ASU does not require GRE scores. In-state and out-of-state students pay the same tuition rate. Mizzou was founded in 1839 in Columbia, Missouri, and is one of the oldest public institution in the country. Today, the school offers a variety of distance learning programs, including an online master's of education in learning, teaching, and curriculum. Students can choose from one of six specializations: early childhood education, literacy, mathematics, social studies, and teaching English to speakers of other languages. Graduates commonly go on to new roles as subject-matter specialists, curriculum coordinators, supervisors of instruction, department heads, leaders of professional development education, or teacher educators. The program consists of 33 credits, with nine credits dedicated to learning, teaching, and curriculum core. Students enroll in a combination of concentration and elective courses to complete the rest of the degree. Some specializations, such as the literacy education, include a research capstone that has students explore a relevant topic of their choice and present their findings to faculty. Most specializations do not lead to certification, also some allow students to enroll in a course that counts towards graduate certificates. Mizzou offers three start dates throughout the year. Applicants must have a bachelor's degree with a minimum GPA of 3.0 and two years of related work experience to be considered. All online students at Mizzou pay the same tuition rate, regardless of residency. Certification pathways can differ from state to state, and Mizzou recommends that students outside of Missouri should check with advisers to ensure that the curriculum matches up with their state regulations. The College of Education is accredited by the Council for Accreditation of Educator Preparation. Appalachian State was founded in 1899 in Boone, North Carolina, as a teacher's college. Today, the school is a premier part of the University of North Carolina system and offers a variety of distance learning programs, including an online master's of arts, curriculum specialist. The program prepares students to improve their instruction techniques by working with education administrators and school leaders. Graduates enter the workforce as experts in leadership, instruction, curriculum development, and staff development. This online master's in curriculum and instruction program consists of 39 credit hours. Students take 34-36 credits of required courses, covering major topics such as diversity, supervision of instruction, teacher leadership and school improvement, and public school administration. The program also requires three to five hours of approved graduate electives. Students gain hands-on experience through a three-credit internship/practicum in either curriculum instruction or school administration. This requirement takes the place of a thesis or final examination. Online students at Appalachian State are paired with an academic coordinator during admissions who will assist them throughout the program. An academic coordinator helps students access college resources, select courses, and ensure that they meet all graduation and other academic requirements. This program offers one start date per year in the fall. Out-of-state students should check with their state's department of education to determine whether this program meets state licensure requirements. Applicants must have both a bachelor’s degree and a state teaching license to be considered. Appalachian State is accredited by the Southern Association of Colleges and Schools Commission on Colleges. NSU was established in 1964 in Davie, Florida. Today, the school serves more than 24,000 students each year and offers some of the best online programs in the region. The school offers a master's of science in education with a specialization in curriculum, instruction, and technology. This program is ideal for either experienced teachers and administrators, or those with a bachelor’s degree who want to increase their knowledge of curriculum development and education. This degree is offered entirely online and combines research-based instruction methods and best teaching practices. The online master's degree in curriculum and instruction consists of 36 credits, with foundational courses covering topics such as theories of learning, research in education, and assessment of learning. Students also enroll in specialized courses in media and educational technology, such as introduction to web authoring and web 2.0 tools for teaching and learning. The program concludes with a final special topic project, which involves hands-on research and analysis on topics in curriculum design, planning, and organization. The curriculum includes two special topics courses: the first has students survey a broad range of curriculum issues, while the second course has them synthesize their own learning experiences throughout the program. They will also assemble a final portfolio representing their strongest work from throughout the program. Applicants must have a bachelor's degree from a regionally-accredited institution with a minimum GPA of 2.5 to be considered, though it does not need to be in an education-related field. Unlike many comparable programs, NSU’s curriculum and instruction degree does not require applicants to hold teacher licensure. NSU is accredited by the Southern Association of Colleges and Schools Commission on Colleges. Based in Irvine, California, Brandman's master of arts in education with an emphasis in curriculum and instruction is one of the most flexible online curriculum and instruction programs available. The program is available in fully online and hybrid formats, and instructors hold the highest degrees in their field. Students learn how to analyze and apply best practices, use research to develop appropriate methods, and determine whether curricula designs meet the needs of diverse students. The curriculum comprises 30 credits. Students take 18 core credits before completing 12 credits in the curriculum and instruction emphasis. All core courses and the first three emphasis courses follow a prescribed sequence. For the fourth emphasis course, students choose from 22 options, including theories in language structure and acquisition; history, social science, and visual and performing arts in K–8 classrooms; content-specific strategies for single subjects; and domestic experiential education. Applicants must hold an active teaching credential, a bachelor's degree from a regionally accredited college or university, and a minimum 2.5 GPA in their last 30 undergraduate credits. Brandman does not require applicants with a GPA of 3.0 or better in their last 30 undergraduate credits to provide pre-graduate examination scores. Applicants who hold a master's degree are exempt from GPA and examination requirements. Applicants must submit two letters of recommendation. All students pay the same tuition rate, regardless of residency. Brandman offers discounted tuition rates to military students. Based in Lubbock, Texas Tech offers a master of education in curriculum and instruction with thesis and non-thesis tracks. Students earning the master's in curriculum and instruction online complete 36 hours. The flexible program allows students to take any number of courses per semester, so degree completion times vary. However, students who take two courses per semester complete the program in two years. The program requires a three-hour college foundations course and three hours of research. Non-thesis students take 15 hours of curriculum and instruction courses and 15 hours of specialization coursework. Thesis students take only nine hours of curriculum and instruction courses. Texas Tech delivers coursework entirely online and requires no campus visits. However, distance learners are welcome to visit campus and interact with peers and faculty in person. The university makes admissions decisions on a rolling basis. Applicants must hold a bachelor's degree and must submit unofficial transcripts. Texas Tech requires official transcripts from admitted students. Admissions decisions are based on a holistic evaluation of the applicant's academic and professional achievements. Texas Tech sets no undergraduate GPA requirements. While applicants are encouraged to submit GRE scores, exam scores are not required. Residents of Texas, New Mexico, and Oklahoma pay a discounted tuition rate. UHM is located in Manoa and is the flagship campus of the University of Hawaii system. The school offers a variety of distance learning programs, including an online master's of education in curriculum studies. This program is perfect for teachers who are already licensed and who want to pursue curriculum and instruction jobs in K-12 education. Students choose one of three concentrations: literacy specialist, reading, or teacher leadership. This program does not lead to teacher certification, but the literacy specialist concentration can add a credential to a Hawaii teacher’s license. The 30-credit program includes 12 credits dedicated to core studies in curriculum leadership, education research, and a curriculum seminar. The middle school track focuses on education practices for early adolescents from ages 10-15, while the secondary school track expands that range to include secondary students, covering ages 10-18. The literacy specialist concentration is an 18-credit graduate certificate that trains teachers to support all types of student literacies, including digital, visual, media, and critical. Coursework covers topics such as literacy assessment, literacy coaching, and new literacies leadership. Students who complete the certification can apply their credits toward the master's of curriculum and instruction degree. Most classes are offered asynchronously online, allowing students to complete coursework at their own pace and on their own schedule. The program begins during the summer semester and can be completed in two years of part-time study. Students are expected to maintain a minimum GPA of a "B" average throughout the program. UHM is accredited by the Western Association of Schools and Colleges. U of M offers a master's of science in instruction and curriculum leadership that is designed for students seeking advanced education skills, and is not intended for those seeking their first teacher certification. This 30-credit online master's in curriculum and instruction degree offers concentrations in instructional design and technology, school library information specialist, and reading. The program emphasizes how students acquire knowledge, how to adapt teaching techniques to students with different needs and backgrounds, and how to use and evaluate teaching strategies for maximum student impact. The instructional design and technology program focuses on the use of technology in the classroom, training teachers to utilize technology tools in both curriculum planning and teaching. The school library track teaches students how to become expert librarians and media specialists, while the reading concentration prepares students to become literacy experts and advocates. This 30-credit program consists of three credits in educational research, 12 credits in their concentration area, and 15 credits in electives, which can be used to further specialize their studies. Depending on a student's chosen concentration, they must complete either a master's project or an advanced practicum to conclude the program. The master’s project requires students to perform original research on a relevant education topic, while the practicum has them complete supervised work in a professional educational environment. Students can further specialize their degrees by pursuing certificates in fields such as literacy leadership, urban education, and autism studies. U of M is accredited by the Southern Association of Colleges and Schools Commission on Colleges. Based in Westminster, Maryland, McDaniel College offers a fully online master's degree in curriculum and instruction that provides practical skills that apply to a variety of professions. The master of science in curriculum and instruction is ideal for teachers and educators in grade school and postsecondary institutions, but the degree also helps business and public service professionals advance to leadership roles in staff development. From 2011 to 2013, McDaniel conferred 40% of all curriculum and instruction degrees in the state. The curriculum requires 34.5 credits and includes courses and seminars in curriculum analysis and planning, education policy, differentiation and technology, and research. Like many of the best online curriculum and instruction programs, McDaniel's program concludes with a capstone project. Students choose from three capstone options: a portfolio, an intensive research project, or a synthesis experience. McDaniel offers five enrollment dates throughout the year. Applicants who hold a bachelor's degree must submit only official transcripts and one letter of recommendation. McDaniel College has no minimum GPA requirement and does not require pre-graduate examination scores. The college makes admissions decisions on a rolling basis, but recommends that prospective students submit application materials at least three weeks before their desired start date. In-state and out-of-state students pay same tuition rate. Designed for education professionals, DBU's master of education in curriculum and instruction trains students for positions as educational and curricular department heads, content specialists, and curriculum specialists. The fully online program consists of 36 credit hours and does not include a thesis. Students take 21 hours of core courses and 15 hours in a specialized concentration, such as curriculum and instruction specialist, Christian school administration, English as a second language, or life coaching. While the university allows students to substitute courses with the approval of the program director, student must complete at least 18 hours of graduate-level coursework. At the conclusion of the program, students defend their degree through a digital capstone portfolio. A board of experienced educators evaluate the capstone defense. The university recommends that students take a capstone defense workshop. While students may take the first four courses without providing pre-graduate examination scores, students must submit GRE or GMAT scores before advancing through the program; grades of at least A- in each of the first four courses exempts students from this requirement. Applicants who earned either a master's degree at DBU or a bachelor's degree with a minimum 3.25 GPA at DBU are also exempt. The university makes admissions decisions on a rolling basis. Prospective students must have earned a bachelor's degree with a minimum 3.0 GPA and must submit official transcripts. Applicants must submit a statement of purpose and letters of recommendation. The admissions committee considers both academic or professional achievement. DBU accepts up to 12 transfer credits. Texas residents and out-of-state students pay the same tuition rate. UT Arlington offers three versions of an online curriculum and instruction degrees: a master of science in curriculum and instruction with specializations in literacy studies, mathematics education, and science education. Each program requires 30 credit hours and takes 18 months to complete. UT Arlington requires no thesis; students complete a final capstone project. The program is structured in seven-week terms, and all courses follow a prescribed sequence. Because the mathematics and science education programs appeal to professionals in a variety of educational and professional settings, including employees of museums, nature preserves, nonprofit organizations, and corporations, they do not lead to Texas teaching licensure. The literacy studies program, on the other hand, is an approved Texas educator preparation program. Graduates are eligible to obtain reading specialist, master reading teacher, and English as a second language certifications. Candidates for these certifications must hold an active Texas teaching certification and must have two years of full-time classroom teaching experience. Applicants must have a bachelor's degree. To receive unconditional admission, applicants must have a minimum 3.0 GPA in their last 60 undergraduate credit hours, GRE scores of 400 quantitative and 500 verbal, and three letters of recommendation. To receive probationary admission, applicants must have a minimum 3.0 GPA in their last 60 undergraduate credit hours, relevant professional experience, and a writing sample. All online students pay the same tuition rate, regardless of residency. The university encourages students outside Texas to check their state's licensure regulations before applying. UMass Lowell offers an online master's degree in curriculum and instruction for experienced teaching professionals. The curriculum consists of 30 credits. Students can pursue optional specializations in autism studies or science education. Each specialization requires 15 credits, which students take after completing 12 credits of core requirements. Each specialization comprises four prescribed courses and one specialization elective. The program concludes with a three-credit capstone project. Students explore topics such as promoting healthy student lifestyles, educating diverse populations, dynamics of curricular change, and history and theory of curricular change. Students pursuing the science education specialization learn about energy, force, and motion; climate change in the classroom; the nature of science; and leadership in science. Autism studies courses include teaching and positive behavioral support, autism behavioral intervention program models, legal and ethical issues in professional practice, and measurement and experimental design in behavioral intervention. Applicants must have an active teaching license and must be employed as a classroom teacher. Applicants must hold a bachelor's degree and must submit official transcripts, a statement of purpose, three letters of recommendation, and a resume. UMass Lowell does not require GRE scores. Due to state and federal regulations, the online program is not available to residents of Arkansas, Kansas, or Minnesota. All online students pay the same tuition rate, regardless of residency. The College of Education receives accreditation from the National Council for Accreditation of Teacher Education. Based in Muncie, Indiana, Ball State University offers a multidisciplinary online master's degree in curriculum and instruction geared toward business educators who work in middle school, high school, and postsecondary settings. The master of education in curriculum and instruction program requires 30 credits, including six core courses and two courses on student organizations and occupational safety and health. While most of the course sequence is prescribed, students choose two electives such as alternative school curricula, evaluation of educational personnel to strengthen curriculum, principles and procedure of curriculum development, and curriculum evaluation. Unlike most online curriculum and instruction programs, Ball State's program requires no final capstone. The curriculum includes a three-credit research methods course. Students take classes entirely online, with no on-campus requirements. Ball State delivers online courses asynchronously, which provides flexibility for students balancing work and studies. Learners meet deadlines and participate in weekly discussions. Online students have access to library services, a writing center, tutoring, and tech support. Applicants must submit official transcripts and must have either a minimum 2.75 cumulative undergraduate GPA or a minimum 3.0 GPA for their last 60 credit hours. The program offers start dates in the fall, spring, and summer, with applications due at least one week prior to the enrollment date. Indiana residents pay a discounted tuition rate. TAMUC was founded in 1889 in Commerce, Texas, and is one of the country's oldest state universities. Today, the school offers a variety of distance learning programs, including an accredited master's in education curriculum and instruction. Students can choose either a master's of education or a master's of science degree. Both programs are designed for experienced teachers who want to pursue educational leadership positions. The MEd is suitable for either certified teachers or those with a bachelor’s degree in education, while the MS is better for those enrolled in alternative certification programs. These programs are offered entirely online and in a hybrid format. The program consists of 36 credits, split evenly between core courses and electives. The 18-credit core curriculum includes nine credits of required courses, focusing on foundational topics like classroom management, diversity and equity in education, and research literature and techniques. Students then have the option to complete 18 additional credits in a chosen specialization or 18 additional credits in support courses for a generalist degree. Elective courses also allow students to earn one of many professional graduate certifications, such as bilingual/ESL education, gifted education, and master reading teacher. During their final semester, students must take a written master’s comprehensive exam, which covers all course material from the core program curriculum. Applicants must have a bachelor's degree and one of the following criteria to be considered: a valid teaching certificate, passing PPR, ExCet, or TExES scores, or official GRE scores. TAMUC is accredited by the Southern Association of Colleges and Schools Commission on Colleges. Based in Boca Raton, FAU offers a Master of Education in Curriculum and Instruction designed for educators in multiple contexts across grade levels. Students can choose fully online specializations in multicultural education, teacher leadership, and TESOL/bilingual education. They may also choose hybrid specializations in art, early childhood education, English, foreign language, mathematics, social sciences, and science. The curriculum is approved by the Florida Department of Education and receives accreditation from the Council for the Accreditation of Educator Preparation (CAEP). Students complete the 36-credit program asynchronously and can choose from a cohort-based format to graduate in 24 months or create a plan of study that works best to accommodate their needs. In their coursework, students experience a blend of educational theory and practical application, simultaneously preparing them for further graduate study and building their knowledge base as an educator. 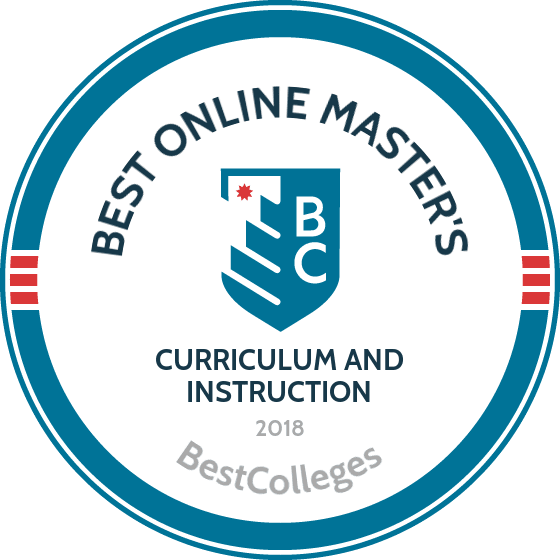 Many of the courses in the program are Quality Matters certified and our online instructors excel at meeting students’ needs through innovative online pedagogy. Students take 15 credits of core courses, 6 credits of research courses, and 15 credits of specialization courses. Students can work with an advisor to design their own concentration. Coursework explores education from a global perspective, such as diversity issues related to race, gender, and class; trends and issues in curriculum and instruction; and the assessment of curriculum development and classroom instruction. The program culminates in a three-credit action research capstone project conducted within their own classroom and/or community. FAU offers three start dates per year. Applicants must hold a bachelor's degree from a regionally accredited institution and must submit official transcripts and GRE scores. Applicants with at least a 3.0 GPA for their last 30 undergraduate credits must have minimum GRE scores of 148 verbal, 145 quantitative, and 3.5 analytical writing. Applicants with GPAs from 2.5 to 2.99 for their last 60 undergraduate credits must have minimum GRE scores of 153 verbal, 145 quantitative, and 3.5 analytical writing. Florida residents pay a discounted tuition rate. Founded in 1899 in Stephenville, Texas, Tarleton State University is known for its agriculture and education programs. Tarleton maintains one of the oldest and most extensive public school-improvement partnerships in the nation. The university offers a number of education programs featuring online and hybrid courses, including an online M.Ed in curriculum and instruction. Most students complete the 30 to 33 required credit hours in eighteen months. The program features an intensive, research-based curriculum and offers 11 concentrations, including English as a second language specialist, technology applications, and instructional specialist. Core coursework covers topics including curriculum design and implementation, techniques of research, and foundations of curriculum. Students may complete an internship, literacy practicum, or capstone. Tarleton delivers online coursework asynchronously and synchronously through Blackboard. Some of the concentrations requires in-person components and culminates in a comprehensive test that covers core and concentration topics. The program's thesis option is ideal for students who plan to pursue doctoral work. Applicants must have earned a bachelor’s degree with a minimum 2.5 GPA; those with GPAs lower than 3.0 must also submit GRE scores. Each concentration has specific admission requirements; for example, the professional reading specialist concentration requires a 3.0 GPA, a valid teaching certificate and employment, and at least two years of classroom teaching experience. Students must complete the program within six years of admission. Founded in 1865 in Lawrence, the University of Kansas offers practical distance learning programs designed to provide working professionals with an affordable education. The university offers a number of fully online degrees and certificates, including an online master’s degree in curriculum and instruction. The program requires 30 to 36 credit hours, which most students complete within two years. The flexible curriculum is ideal for working professionals earning their master’s in curriculum and instruction online. The program emphasizes instructional strategies, theory of pedagogy and learning, and methods for utilizing research-based instructional technology. The core curriculum includes topics such as curriculum planning for educational settings, differentiating curriculum and instruction, and multicultural education. Students can select an area of emphasis: reading education or teaching English to speakers of other languages. The reading specialist degree is available in a 30-hour reading specialist licensure track and a 33-hour non-licensure track. Students earning the master’s in curriculum and instruction online choose between a 36-hour comprehensive exam track and a 30-hour thesis or project track, which requires students to assemble an instructional portfolio. Students take courses synchronously and asynchronously through Blackboard. Some instructors require students to stream live lectures and participate in real-time discussions. Applicants must have earned a bachelor’s degree from a regionally accredited institution with a minimum 3.0 GPA. Established in 1976 as a prep school, CUI offers a number of fully online degrees, including an online master’s degree in curriculum and instruction. The program is available in fully online and blended formats. The 30-unit M.Ed in curriculum and instruction program follows a cohort model and is available in two-year and accelerated, one-year formats. Students develop skills in educational design, ethical leadership and disciplinary pedagogy, and analytical self-critique. Course topics include curriculum design and assessment, brain-based teaching and learning, and developing character and ethics. Mentoring educators provide students with guidance and feedback throughout the program. Learners implement educational strategies with the support of their mentor and cohort. The program culminates in a group capstone project during which students develop and present a faculty-approved action research report. Students take courses asynchronously through Blackboard, allowing working professionals to complete coursework at their convenience. Applicants must have earned a bachelor’s from an accredited institution with a minimum 2.7 GPA and must submit teaching credentials or experience teaching in a private or parochial school. Students can apply up to 30 units of 500-level certificate work toward their master’s in education. Online students have access to the online writing lab and the Grammarly online writing help service. ESU was established in 1863 in Emporia, Kansas. The school is a major center for education in the state, as 25% of Kansas school administrators hold at least one degree from The Teachers College at ESU. The school offers a master's in curriculum and instruction with three concentrations: curriculum leadership, effective practitioner, and national board certification. This program is ideal for a diverse range of educators, including those who want to improve their classroom performance and those who want to focus their career on curriculum development. This 34-credit degree consists of 25 credits of core program courses, such as curriculum leadership, restructuring classrooms with technology, cultural awareness for educators, and analysis in research. Students in each concentration complete nine credits of specialized courses focused around their area of interest. Curriculum leadership courses focus on the design, implementation, management, and assessment of curriculum programs in both public and private schools. Effective practitioner courses teach teachers how to develop classroom skills, though this track may also be relevant to teachers interested in moving into faculty development as well. The national board certification track prepares teachers for the review process that leads to national certification. Students in all tracks also complete a practicum experience that allows them to demonstrate their leadership abilities in a supervised educational setting. The practicum must be completed during either their final fall or spring semester of the program. Students can transfer up to nine credits into the program from another institution, as long as they were earned with a "C" grade or higher. Applicants must have a bachelor's degree with a minimum GPA of 3.0 in their final undergraduate credits to be considered. They must also complete an essay describing their leadership skills, career goals, and motivations for attending graduate school. GRE and GMAT scores are not required for admission. Emporia State University is accredited by the Higher Learning Commission. Founded in 1909 in Cambridge, Massachusetts, Lesley University offers widely respected programs in education, therapy and counseling, and the fine arts. The university, which was founded to train kindergarten teachers, offers an online master’s degree in curriculum and instruction. Most students complete the 33-credit program in two years. One of the most practical online curriculum and instruction programs, Lesley's curriculum integrates practices, such as the 5E model, that emphasize active student involvement. Graduates understand current teaching methods and evolving educational technology. Students explore principles of education and pedagogy relevant to an elementary school setting. Required courses include dimensions of teaching and learning, dimensions of equity, and a collaborative action research seminar. The program offers concentrations in English language learners, math, and literacy. Concentration course topics include essential linguistics, content literacy, and the teaching of writing. Students take online courses primarily asynchronously through Blackboard, but some courses require synchronous elements, such as live chats. Applicants must either hold a Massachusetts initial elementary teaching license or sign a non-licensure agreement. The program is accredited by the Massachusetts Department of Elementary and Secondary Education to award in-state students professional licensure in teaching grades one through six. However, the program does not lead to in-state licensure for Massachusetts students who do not hold an initial elementary teaching license. Online students have access to writing tutoring. Founded in 1944, Fresno Pacific University offers diverse specialization options for learners seeking education-related credentials. FPU students can combine their master's in education with coursework necessary to obtain academic credentials in specific subjects at the middle and high school levels. FPU offers a number of education-related credentials and degrees online, including an online master’s degree in curriculum and instruction. The program requires 30 to 31 credits and is designed for working K–12 educators who want to improve their instructional practice and curriculum development skills. The program is also ideal for professionals in fields such as corporate training and human resources, as the curriculum provides a foundation in leadership theories and current educational technology. Most students graduate in two years. Coursework covers topics such as historical foundations of curriculum, conflict management and peacemaking in schools, and using technology to differentiate learning. The program culminates in either a project capstone and a research-intensive thesis capstone. The project capstone requires students to draft a description of an action research project’s methodology, implement the project, and analyze the results. Thesis capstone students undertake an extensive, partly independent literature review and, with the help of a thesis mentor, assemble their findings into a master’s thesis. Students complete online courses synchronously through Moodle; most classes meet twice per month. Instructors utilize live discussions and lectures. Each student has access to a personal student success coach. Founded as a Bible college in 1932, Clarks Summit University is an affordable, private university. The Christian institution offers online degree and degree completion programs, including an online master’s degree in curriculum and instruction. CSU delivers the 31-credit program in eight-week semesters, and most students graduate in two years. CSU also offers the program in an accelerated format. The core curriculum explores topics such as curriculum development, instructional design, leadership in educational settings, and learning disabilities. A project comprises the final segment of the curriculum. The program prepares students for education and training positions in missionary work, postgraduate studies, and positions as teachers and curriculum supervisors. CSU requires online students to participate in local ministries. Students take courses asynchronously through Moodle Schoology. Some online courses involve collaborative components. Applicants must have earned a bachelor’s degree with a minimum 3.0 GPA. Applicants without an undergraduate degree in education must complete prerequisite coursework. Distance learners have access to an online writing center. CSU's M.Ed program is accredited by the Pennsylvania Department of Education. Founded in 1876, CU Boulder offers a variety of online programs, including a master’s in curriculum and instruction for math and science education. Full-time students typically complete the 30 required credit hours in two years. The curriculum provides knowledge and skills necessary to teach math and science to K–12 students. Learners explore current pedagogical models and educational technology. Foundational course topics include curriculum theories, gender issues in education, and ethics in education. The program culminates in a comprehensive exam capstone. Courses specific to the math and science education track include perspectives on mathematics, teaching and learning chemistry, and spirituality and religion in teaching. Students can further strengthen their math and science foundation by taking up to six hours in 3000-level classes from the college of arts and sciences. Students take online courses primarily asynchronously through the Canvas and Desire2Learn learning management systems. CU Boulder offers online courses in self-paced and term-based formats. After earning at least six credit hours through the university, students may transfer up to nine credit hours obtained at least five years before admission. In addition to math and science education, CU Boulder offers master’s degrees in curriculum and instruction for the humanities and literacy studies. Students must maintain a minimum 3.0 GPA and must graduate within four years of admission. Founded in 1905 as a prep school, Concordia University-Portland is a Christian university that has offered online programs since 2002. The university's affordable, fully online certificates and degrees meet the same standards as its on-campus programs. Concordia University-Portland offers an online master’s degree in curriculum and instruction in fully online and hybrid formats. Most students complete the 30 required credits in one year. The program is designed for working educators who want to specialize and strengthen their knowledge base. Core coursework includes topics such as theories of teaching and learning, developing character through curriculum, and contemporary educational thought. Students take courses primarily asynchronously through Blackboard. Some instructors require synchronous online classroom elements, such as chats and lectures. The program offers more than a dozen concentrations, including methods and curriculum, educational technology leadership, and an inclusive classroom program that prepares learners to serve students with disabilities in general education classes. Students can pursue multiple concentrations through a dual concentration option. Applicants must have earned a bachelor’s degree from a regionally accredited institution with a minimum 2.8 GPA and must submit documentation of their work history and a statement of intent. The program does not provide licensure. Founded in Mequon in 1881, Concordia University Wisconsin provides affordable, practical distance education programs. Among the university's fully online programs is an online master’s degree in curriculum and instruction. The 31-credit program adheres to standards set by the Interstate Teachers Assessment and Consortium and National Board for Professional Teaching Standards. Most students graduate in one year. The program prepares working educators to design needs-based curricula and to pursue leadership positions, such as principal or vice principal. Coursework covers topics including leadership in curriculum and instruction, standards-based curriculum and instruction, and instructional technology. Students work with a university research supervisor to craft a guided action research report that results in a professional portfolio, which students can implement in classrooms. Students take online courses through the Canvas learning management system, primarily asynchronously. Some instructors require synchronous online classroom elements, such as live chats and lectures. Transfer students may apply up to six graduate credits toward the degree. Applicants must have earned a bachelor’s degree from an accredited institution with a minimum 3.0 GPA and must have relevant work experience. Distance learners complete an online orientation and a series of mandatory quizzes before beginning program requirements. Students must maintain a minimum 3.0 GPA. Founded in 1973, UHV provides affordable distance and continuing learning programs. UHV was the first Texas university to offer an accelerated bachelor’s degree students could complete in three years. The university's variety of online degrees include an online master’s degree in curriculum and instruction. Most students complete the 30 to 39 required semester hours in two years. The program prepares students for leadership roles in a variety of educational settings. The flexible curriculum is designed for working professionals who want to advance in a specialized field. Core coursework covers topics including education in a diverse society, human growth and development, and foundations of educational research. Students earning the master’s in curriculum and instruction online choose from eight concentration options, including English as a second language, educational technology, and elementary science education. Each concentration involves unique requirements, but most concentrations culminate in a three-hour professional research project. Some concentrations, such as the literacy reading specialist concentration, require an internship, practicum, or comprehensive exam. Applicants must have earned a bachelor’s degree from an accredited institution with a minimum 2.5 GPA. Applicants must complete the Texas Success Initiative, the Nelson-Denny Reading Assessment, and the Texas Higher Education Assessment. Applicants complete an in-person interview and a character review. Students must maintain a minimum 3.0 GPA. Though the program does not grant certification, graduates are prepared to obtain the State Board for Educator Certification. Founded as a women's school in 1870, Williams Woods University is now a co-educational institution offering fully online degrees and degree completion programs, including an online master’s degree in curriculum and instruction. Full-time students typically complete 33-credit program in about two years. The program is also available in an accelerated format, which is ideal for students with personal or professional commitments. The program is designed for experienced educators and provides networking and professional development opportunities. Students gain research experience to prepare them for post-graduate work. The program comprises eight-week courses and offers flexible start dates. Course topics include current issues in teaching and learning, curriculum construction, and schools and law. Students complete three required elective courses, the last of which is a six-credit action research requirement, which students can fulfil with a single capstone project or an action research project with additional coursework. Students take online courses asynchronously through Moodle. Applicants must have earned a bachelor’s degree from an accredited institution with a minimum 2.5 GPA. WWW students must maintain a minimum 3.0 GPA. Students have access to online tutoring and Moodle chat support. Founded in 1971, UT Tyler's campus is located in a suburban setting and offers affordable distance learning programs, including an online master’s degree in curriculum and instruction. The M.Ed requires 30 credit hours, which students typically complete in two years, and is available in fully online and hybrid formats. The curriculum is designed for professionals interested in creating dual enrollment or junior college pedagogic content. Course topics include applied learning theories, historical and philosophical foundations of American education, and current issues in education. The program also requires coursework in human diversity issues. Students complete 12 hours of specialization coursework in topics such as Instructional Coaching, STEM Education, Educational Technology and Single Content Specialization for secondary teachers; students can select coursework across specializations or in one focus area. The program culminates in a comprehensive exam during which students demonstrate their understanding of the core curriculum and their specialization. Students take coursework asynchronously through the Canvas learning management system. Transfer students can apply up to nine credit hours toward the degree. Applicants must have substantial professional experience as a licensed educator, a bachelor’s degree from an accredited institution, and a minimum 3.25 GPA or sufficient GRE scores. UT Tyler students must maintain a minimum 3.0 GPA. In addition, students seeking initial teacher certification who already have a bachelor’s degree may complete their M.Ed. in Curriculum and Instruction while completing their certification through the school's Grad Teach specialization. Students at the University of Scranton can earn a master's in curriculum and instruction online at an accelerated pace. Ideal candidates for the fast-track program are licensed teachers or uncertified private school teachers. Students in the master of science in curriculum and instruction program complete 36 credit hours and graduate in 14 months. After completing 12 credit hours of foundation courses that cover advanced topics in educational psychology and curriculum theory, students take 21 credit hours in curriculum and instruction. Required courses include teaching the gifted child, inclusionary classroom practices, integrated technology in the classroom, and literacy and learning across disciplines. The program concludes with a three-credit practicum. Although the program does not include electives, the curriculum explores education from diverse perspectives. The program prepares students to anticipate and respond to the needs of special education and gifted learners. Graduates are equipped to encourage discovery learning and to utilize unconventional educational tests to measure student progress. Applicants must submit official transcripts and a copy of a valid teaching license or a letter confirming employment as a private or parochial school teacher. Applicants must also submit statement of intent, three letters of recommendation, and a resume. The university offers regular, special, and probationary admission. In-state and out-of-state students pay the same per-credit tuition rate. Online students are eligible for financial aid. Students pursuing a curriculum and instruction master's degree online through an accredited program will often have a range of concentrations, courses, and scheduling options to choose from. Program details may vary from school to school. Learning and Development Theories: To design effective school curriculum, you must possess a solid understanding of foundational educational and childhood developmental theories. This course will explore the relationship between learning and teaching and how you can influence student learning. Teacher Leadership: How can teachers be leaders in and outside the classroom? In this course, you'll explore policy issues facing public education today and how teachers can influence school policy on a local, state, and federal level. Reading Diagnosis: In this course, you'll learn how to interpret diagnostic data to determine a student's reading comprehension level and how to use that data to design relevant curriculum. This course will be of special interest to students who want to pursue careers as reading education specialists. HOW LONG DOES IT TAKE TO GET AN ONLINE MASTER'S IN CURRICULUM & INSTRUCTION? Dedicated students can often earn their online master's degree in curriculum and instruction in just one year if they're enrolled full time. Typically, a curriculum and instruction master's degree requires 30 to 40 credits. Earning your online master's degree in curriculum and instruction may take longer than a year if you enroll part time, don't take classes during the summer semester, or try to earn additional certificates. A program following a cohort format can also make earning your degree a slower process. Programs that follow a cohort model require you to start the program at a certain time (typically the fall semester) and work through the program at the same rate as your peers. A program that encourages you to study at your own pace may allow you to take more credits during a semester, so you can earn your degree quicker. Keep these factors in mind as you try to determine the best online master's in curriculum and instruction. English as a Second Language (ESL) Endorsement: Teachers who are interested in designing and implementing curriculum for non-native English speaking students can earn an endorsement or add-on certification for ESL. Endorsement requirements are set by state education departments. You can learn more about the process through the TESOL International Association website. National Board Certification: The National Board Certification is one of the most respected certifications an instructor can have and shows their commitment to teaching. The NBC does not replace state teaching certification requirements, but the NBC's stringent standards -- which include passing an exam and submitting student work -- will help teachers stand out in the field. Accredited curriculum and instruction master's programs will provide you the best value for your money, setting you up for success in the field. Accreditation indicates that a school can provide a quality education because it meets certain set standards. Typically, a school is either nationally accredited or regionally accredited. Regional accreditation is given to an institution that has met the standards of a regionally accredited association. National accreditation is usually reserved for institutions of higher learning that focus on a specific type of education, like distance learning or vocational training. Both types of accreditation are recognized in all U.S. states. The best online master's in curriculum and instruction programs are more likely to be regionally accredited. As you explore curriculum and instruction master's programs you should also be aware of which programs are accredited by the Council for the Accreditation of Educator Preparation (CAEP). The CAEP accredits programs aimed at P-12 educators by ensuring those programs meet high standards and provide evidence of student success. Accreditation associations and other governmental and nonprofit organizations work together to establish the standards that institutions of higher learning must meet, including the Department of Education. The DOE approves accreditors deemed reliable by the Secretary of Education and can only provide financial aid to students who attend accredited institutions. Another organization related to accreditation is the Council for Higher Education Accreditation (CHEA). The CHEA advocates for self regulation among accredited institutions of higher learning to maintain high standards. Over 3,000 colleges and universities are members of the CHEA. For a list of accredited schools visit the the DOE and CHEA websites. When you earn a master's in curriculum and instruction online, you expand the opportunities you can pursue in your career. Careers in education require both a passion for classroom instruction and an analytical perspective. You must understand how students learn best and design a curriculum that will teach them the required information. Below are a few common careers for those with online curriculum and instruction degrees. This role, which usually requires a master's degree, builds on several years of experience teaching in classrooms. These professionals might be employed by a school or a local or state government body. Instructional coordinators develop and oversee the implementation of curricula in schools. They also assess how effective the program is in achieving the desired outcomes such as improving test scores. A principal oversees the daily operations at a K-12 school, including ensuring that the curriculum is being implemented effectively. Among other duties, the principal observes and evaluates the classroom performance of the teachers at their school. They also prepare reports analyzing the students' test scores and overall performance. Principals usually have a master's degree and teaching experience. Postsecondary teachers work for institutions such as universities, professional schools, or community colleges. Many of these roles require a doctorate, but some junior or community colleges only require a master's degree. Postsecondary teachers lead classes and help design the curriculum for their program. Postsecondary education administrators usually hold a master's degree or Ph.D. They work for a college or university's admissions department, registrar's office, or departmental offices. They may also serve as academic deans. Depending on the role, administrators may be involved in activities such as determining which applicants should be admitted as students, helping coordinate student schedules, maintaining academic records, developing academic policies, or overseeing faculty research. A high school teacher leads classes for students in grades 9-12, often specializing in a particular subject area. A master's in curriculum and instruction can help teachers hone their skills in lesson preparation and classroom management. While high school teachers are not required to have a master's degree, it can be beneficial and may create an advantage when applying for jobs. The U.S. Bureau of Labor Statistics projects that the number of available jobs in education will grow by 876,800 positions over the next decade. Salaries for these positions increase steadily over the course of one's career. Positions that require a master's degree usually pay more. As a result, an online master's degree in curriculum and instruction can increase pay. This table displays the median salaries education professionals earn at various stages in their careers. Professional organizations can provide valuable resources for your career, including educational and networking opportunities. Most of these organizations have benefits designed for current students and graduates, including scholarships or internships. They may offer continuing education opportunities in person or online, as well as annual conferences and local meetings where you can learn about the latest trends, research, and issues. These events also provide a chance to network with others in the field. Many professional organizations offer career services and online job boards. It is worth exploring the organizations which might be most relevant to you while you are researching online curriculum and instruction programs. National Education Association (NEA): NEA's three million members include classroom teachers, education support professionals, higher education faculty and staff, substitute teachers, students, and retired teachers. The association has a large and active student program. There are local chapters in every state. American Federation of Teachers (AFT): AFT represents 1.7 million members and over 3,000 local affiliates around the country. The organization supports educational professionals and advocates for pro-education public policy. It also offers various benefits and discounted services to its members, including student debt clinics, scholarships, and travel discounts. ASCD: Originally known as the Association for Supervision and Curriculum Development, ASCD supports educators so they can deliver superior results for their students. Members gain access to online courses, webinars, publications, conferences, consulting services, and leadership training. Members also receive discounts. Students have a variety of financial aid options to pay for their online curriculum and instruction degrees. Depending on the school, they may receive scholarships, loans, grants, and work-study. The first step toward obtaining any type of financial aid is to fill out the Free Application for Federal Student Aid (FAFSA). The FAFSA will determine whether you qualify for any federal funding opportunities. Even providers of private scholarships usually require applicants to fill out the FAFSA so they can verify a student's educational expenses. Many private organizations also offer scholarships for students pursuing postgraduate education degrees. Additionally, you may qualify for a federal TEACH grant.